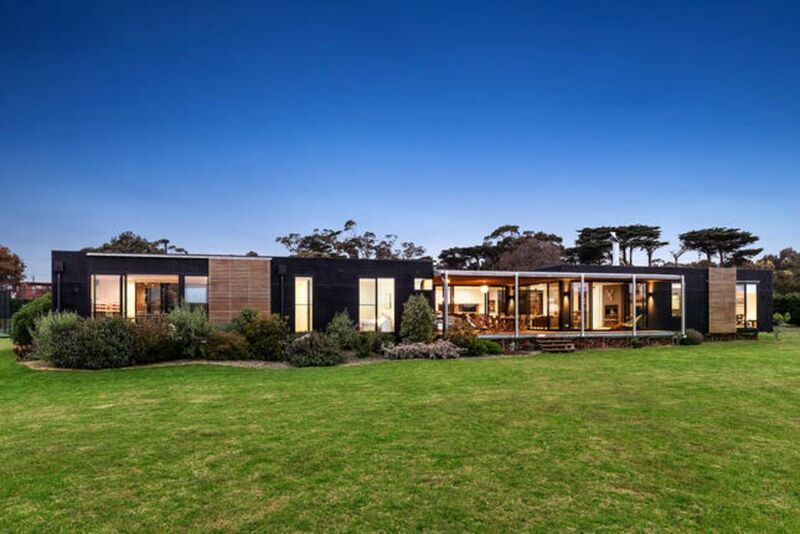 The Pleysier Perkins designed House is only 200 meters from stunning Balnarring & Merricks Beaches. The Property has sweeping rural views and is on 2.5 acres fringed by a huge hedge ensuring your privacy. The facilities mean you may not even leave the property - sweeping lawns, a floodlit tennis court and plunge pool/spa complete this resort like haven. Everything is provided for your comfort and enjoyment - a large covered outdoor entertaining area with BBQ and dining, as well as a comfortable lounge from which to enjoy the view while listening to music on the sound system. Perfect for two families - there are 2 Queen bedrooms, the main with ensuite & walk in robe. In addition, a bunk room with 4 single bunks plus a rumpus room with 4 King single bunks. The kitchen lends itself to grand entertaining, with a large freestanding Smeg oven, large bench areas and pantry with twin fridges (& an icemaker for your drinks). Sitting on the Deck the deep rural views convince you that you are on a farm - but the Beach is just 200 metres away. Stunning views of Mornington Peninsula's rolling hills, dotted with cattle and framed by beautiful lines of tress. A relaxing seaside, country getaway. We had a wonderful time visiting the Red Hill market, eating great local pizza, cooking in the well equipped kitchen, playing tennis, table tennis, reading books and drinking champagne on the deck on a warm Saturday afternoon as we watched the sunset over the beautiful country view of the black cows in the green field with the gentle hills in the background. Loved our time here. The ladies had a wonderful time of refreshment and encouragement as the facility lends itself as a large get away retreat. Nice open paddocks and a beautiful scenery all around! We stayed at the property for 4 night/5 days. It was an outstanding amenity. Everything you need for a holiday was provided.